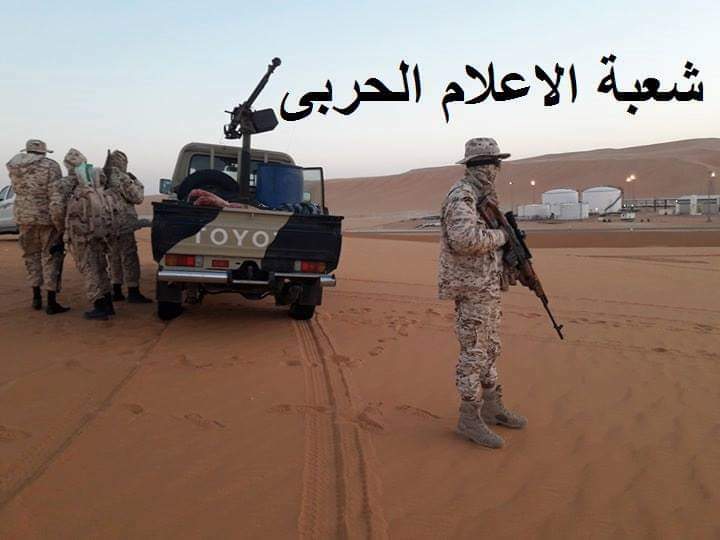 Photos published Wednesday by the LNA’s Military Information Division purporting to be of their “liberation” of the Sharara oilfield (Photo: LNA). The military situations in southwest Libya continues to escalate threatening to destabilize the whole of Libya. Events have cascaded over the last week and are ever-changing, almost on a daily basis. They continue to reflect the power struggle between western and eastern Libya, and the power and security vacuum and local power struggle in the southern region. Days after the Khalifa Hafter-led Libyan National Army (LNA) mobilization in Fezzan’s capital town of Sebha, the LNA announced the killing of key terror elements near Brak Shatti. On Saturday, th LNA clashed with alleged Chadian groups as they strengthened their grip on and around the town of Ghadduwah some 65 Kilometers southeast Sebha. Three LNA members died as a result and reportedly a high number of casualties suffered. However, the Tebu community claim that the LNA is targeting them by allying with local LNA-affiliated groups, particularly of Awlad Suleiman and elements of Zuwai tribe members from Kufra [traditional rivals of the Tebus]. The Tebus also accused the LNA 128th, led by Hassan Matoug Al-Zadma (himself from Awlad Suleiman) of targeting them. The 128th consists of Kufra Zuwai fighters. Two officer Omar Abdulhameed Lebirish Al-Zuwai from Kufra, and Fayez Amer Bu Sharrada also of Zuwai community in Ajdabiya – died in the fighting. This prompted three Tebu officials to resign in protest: HoR member from Murzuq, Rahma Adem, (Eastern) Interim Government Minister of Housing, Ali Kouso and Tebu LNA Social Coordinator, Ali Barka. However, the LNA’s narrative has remained unchanged, namely that it targets only Chadian elements and that it is not involved in any inter-communal tension in the Fezzan. It says it’s there to restore security and clear the south from terrorists and foreign interference. The LNA’s enemies accuse it and Hafter of power-grabbing and destabilizing Libya’s delicate political balance. They see his manoeuvres as part of his greater strategy to take control of all of Libya, including Tripoli, by military means. ”In the town of Ghadduwah, our troops continue to fight the Chadian mercenaries who are supported by Jedran and terrorists who fled Benghazi, we lost three brave men”, tweeted LNA spokesperson Brigadier Ahmed Al-Mismari. Soon before the fight broke near Ghadduwah, video footage showed what appeared to be Sudanese mercenaries, allegedly party of Sudan Liberation Army SLA/MM among the LNA’s 128th. They were passing through the Tebu-held 17-Checkpoint, 17 Kilometers south of Sebha on the way to Ghadduwah. Kanna called upon the Presidency Council and it’s Government of National Accord (PC/GNA), the High State Council (HSC) and the Libya Dignitaries Committee to dissuade the LNA from pursuing itsmilitary operation in the southwest, and prevent Fezzan from falling into a deadly inter-communal armed conflict. Meanwhile, in what is widely perceived as a politically-motivated move, the the PC/GNA head Faiez Seraj (in his role as Supreme Commander of the Tripoli-based Libyan Army) issued a decree appointing Ali Kanna as Sebha military commander on Wednesday. 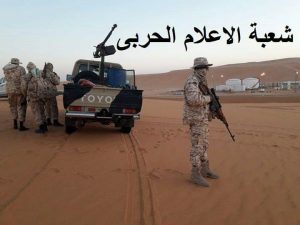 As military action briefly halted near Ghadduwah and Murzuq on Wednesday evening, the LNA spokesperson declared the liberation of the Sharara oilfield. Sharara has been under Force Majeure since December when it was occupied by locals protesting poor conditions. The locals say they are protesting genuine grievances while the National Oil Corporation’s narrative is that the occupiers are armed militias. However, many sources suggest the LNA does not have full control of Sharara. The local LNA-affiliated 177th led by Col. Khalifa Al-Seghair Al-Hasnawi is reportedly stationed at the 86th station on the periphery of Sharara. Their position was then contested by the mostly pro-GNA Tuareg PFG 30th brigade. This lead them to re-locate to the Maghawier barracks before being forced to withdraw again this morning to the nearby Germa village following brief clashes with units loyal to Ali Kanna. LNA Spokesperson Mismari, in haste, had urged the NOC to lift its Force Majeure on Sharara in a press conference, attempting to claim a quick victory on the ground. However, it was clear that the situation at Sharara was still fluid and unstable. On 20 January, the United Nations Mission Support in Libya (UNSMIL) expressed a ”deep concern” about the armed forces mobilization and the potential ensuing consequences. It called upon all parties to ”exercise maximum restraint” and prevent risk of growing imminent conflict. However, UNSMIL has made no comment on the alleged airstrikes near Murzuq which killed 7 and left several casualties. Meanwhile, troops loyal to the PC/GNA Western Region Military Commander, Usama Al-Juwaili are reportedly negotiating to be granted entry to Sharara. His troops are led by Brigadier Idress Bu-Khamada, Juwaili confirmed to Libya Al-harar TV channel on Tuesday. The mostly Tuareg PFG 30th Brigade, perceived as being aligned with the PC/GNA Ministry of Defense, remain reluctant to allow any external troops to enter the Sharara oilfield, including Kanna’s or Juwaili’s. However, the LNA has yet to gain local trust in the deep southwest. It’s military actions face pushbacks by various group who are purportedly allying against the LNA. The LNA’s local opponents are attempting to negotiate a unified local security body called the ”South Protection Forces” (SPF). In its first statement on Saturday (2 February), the SPF stressed its defence of key oil installations, calling upon the Attorney General to investigate the alleged Sudanese mercenaries within the LNA, urged the eastern Cyrenaican tribes to hold their sons back, and refused what it called the naked military aggression used in the pretext of fighting terrorism and combating illegal migrants. Report say he was chased and killed by the LNA Salafist Khalild Bn Walid battalion hours after, as a result 4 soldiers died in the chase-and-kill operation.